Put your dad at the center of attention for his birthday! All your life, your father has been bowing to your wishes. He loves you, after all, and if you really wanted the last cookie in the jar he would give it to you. Let him know that on his birthday, your dad comes first. Everything today is for him. From getting first pick to receiving all of your hugs. 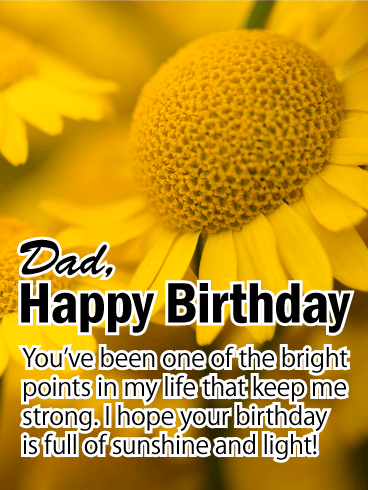 Fill your father’s birthday with sunshine this year! These bright flowers are one of the many things you can give your father to make him smile on his birthday. You can also give him a gazillion hugs. A shiny present. Wishes for a glorious year. And all of your love. 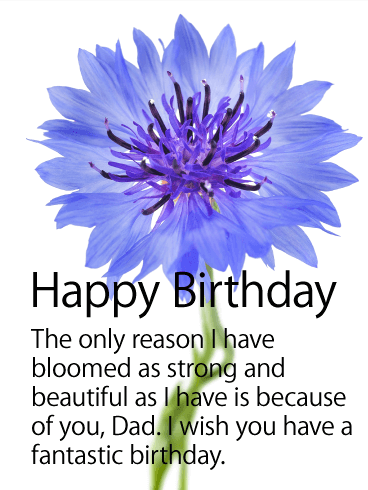 Make your father’s birthday incredible and send him this wonderful card. 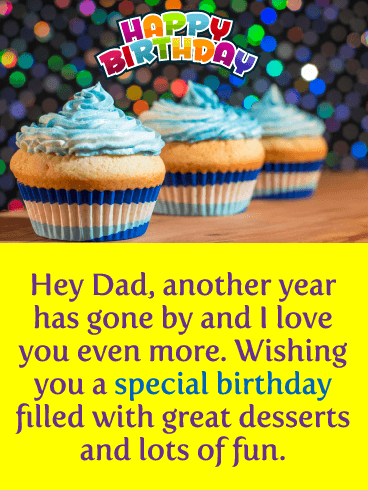 Wish your dad a fantastic birthday this year! After all, he’s been an incredible father. Who you are today is because of the love and care he gave you when you were little, and the love and support he continues to send your way. Let him know that just as he has helped you, you will help him with anything he needs. And today, it’s making sure your dad has an incredible birthday. 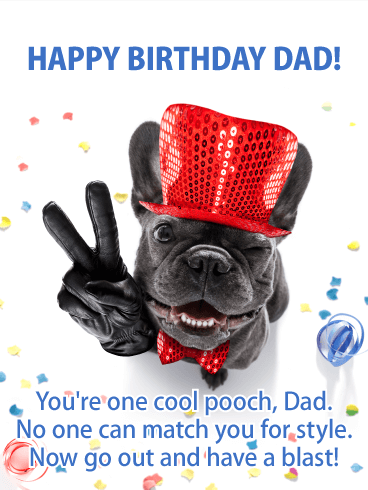 Make your dad’s birthday a spectacular occasion! Spend the day singing his praises. Go all out. Brag about him to your friends. Tell the waiter at the restaurant about the amazing things your dad has done. Let your dad know he is smart, funny, and downright incredible. And then let the world know too because your dad deserves to be seen. 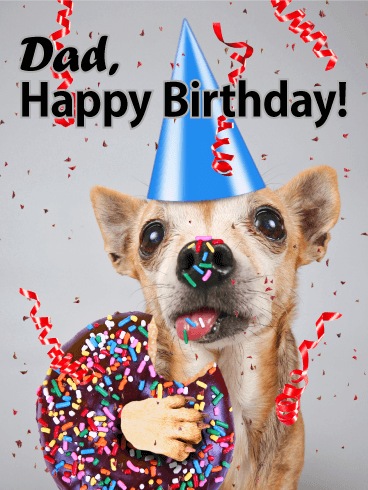 Make your dad the star of the show for his birthday and start the festivities with this birthday card! We press flowers to preserve them. Keep them forever as bookmarks or decorations; memories of a time of happiness and time spent with those we care for. 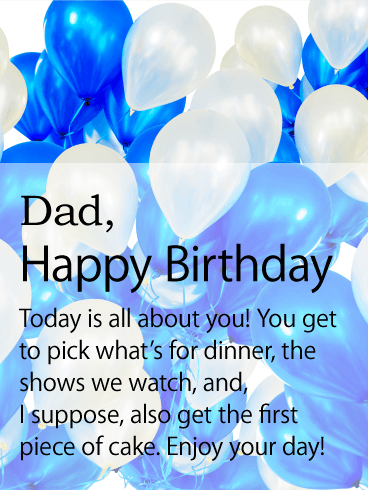 Make your father’s birthday one of those moments worth preserving. Send him this incredible birthday card and let him know how well you think of him. His birthday and all that he is, is well worth remembering forever. Tell your dad how proud you are of him for his birthday! Your dad has always been the ‘cool dad.’ A guy who held the admiration of young boys and girls, a man everyone wished could be a regular part of their life. How lucky then that he is all yours! Wish your father a day filled with acknowledgment and praise. He certainly deserves it for being so amazing! 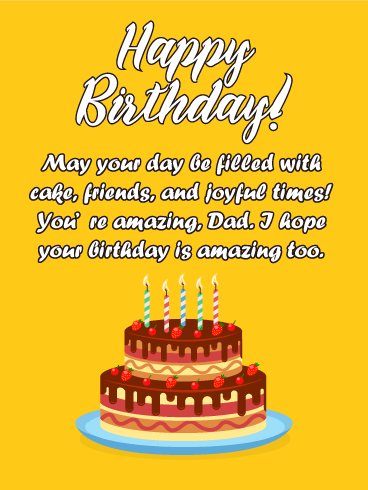 Wish your dad a fantastic birthday with this card! They say things get better with age, so certainly applies to birthday candles too. Right? And what’s better than large birthday candles? Well, fireworks of course! Ditch the cake (it wouldn’t have fit all those candles anyway) and celebrate your dad’s birthday with a display large enough for a whole town to see! 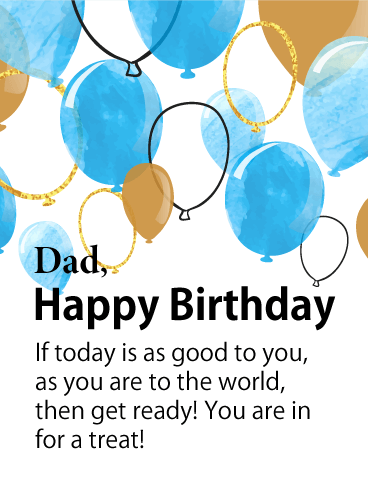 Wish your father the perfect day for his birthday! This is your father’s day to have all his wishes come true. Talk to his loved ones. Celebrate with friends and family. Toss aside his diet and eat ice cream with a fork. Birthdays are free days, but you know there’s nothing he’d like more than for you to be by his side. Send him you love and well wishes on fast wings with this festive birthday card! 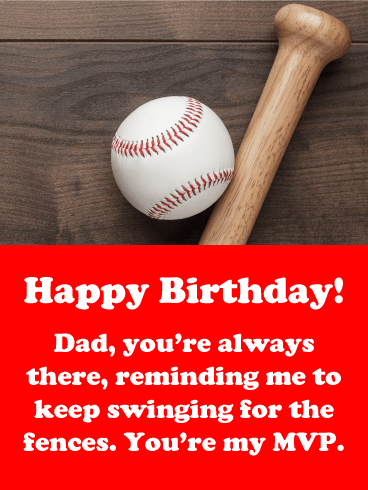 Your dad is your personal MVP, so on his birthday, why not let him know with this baseball-themed birthday card. A bat and ball against a rustic wooden background are reminiscent of memories practicing together. And not matter how old you get, you'll always remember how he encouraged you and cheered you on. Return the favor with your heartfelt words on this thoughtful greeting to a true all-star. 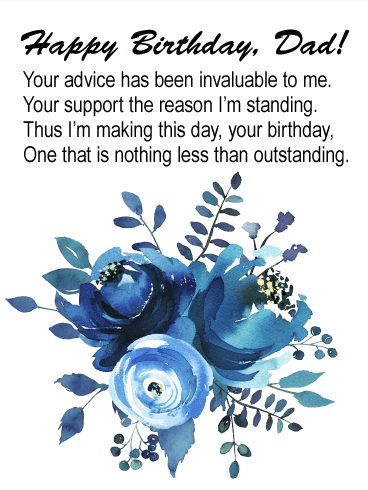 For your dad, who has been there for you though it all, this thoughtful card is a wonderful way to remind him how much of a difference he makes each day. As he celebrates this special day, you want him to know that you hope he's surrounded by love & joy, because nobody deserves it more. 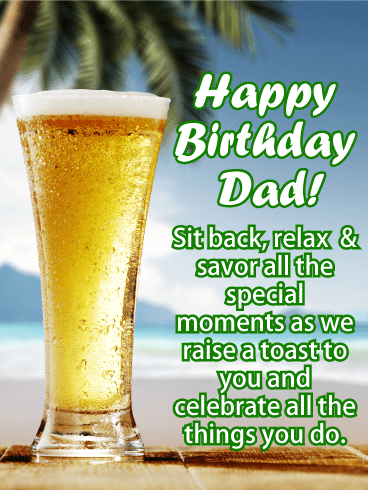 What better way for your dad to spend his birthday than by enjoying an ice cold drink on a tropical island? Even if he can't escape to paradise, this birthday card is a great way to help him savor each special moment by reminding him that this day is all about him. It's a chance to raise a toast to the person you look up to and celebrate all the amazing things he does. 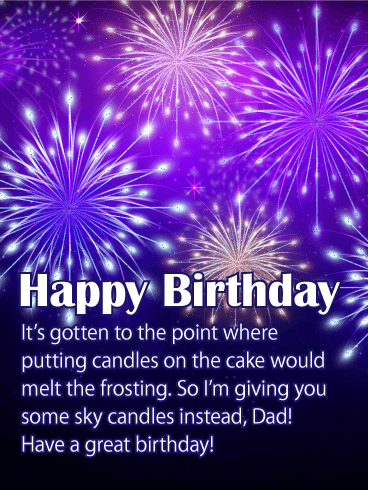 This sentimental birthday card for your dad will light up his celebration! A festive cupcake topped with frosting and sprinkles gets an extra festive touch: a brilliant sparkler to brighten his spirits while helping to wish him an amazing day and year ahead. After all, he's the one who has always been there, guiding you every step of the way. What a wonderful greeting to remind him how much you care. 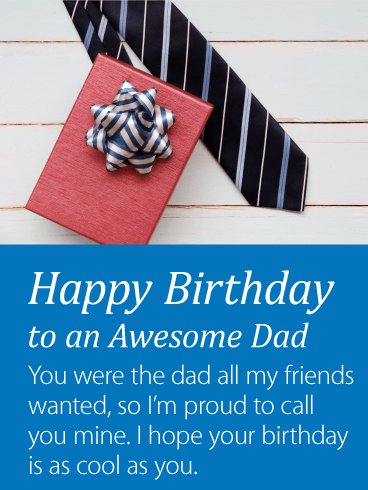 For your dad, who takes on many important roles in your life, this birthday card is a heartfelt way to tell him. All of his everyday essentials are joined by a small gift box, a special surprise to start his day. And on top are touching words to the "protector, provider and positive role model" who makes you grateful every day. What a wonderful way to make him feel loved and remembered. 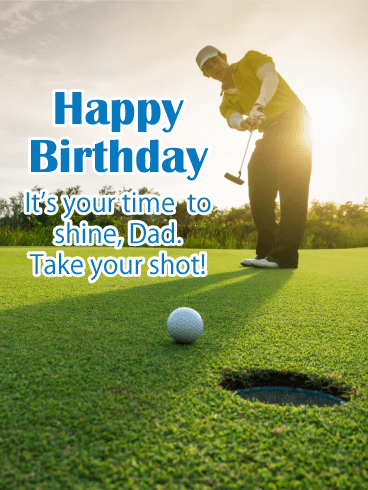 Whether your dad's the ultimate golf lover or the greatest influence in your life, he's sure to appreciate this birthday card. It's your opportunity to wish him a day of fun & celebrating while reminding him that it's his time to shine. 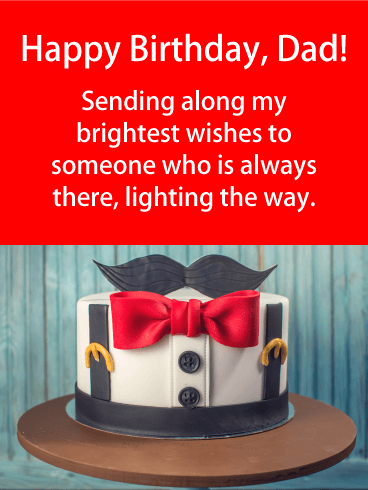 Whether you're there by his side as he blows out his candles or thinking of him from across the miles, this greeting is your shot to show him how much you care. 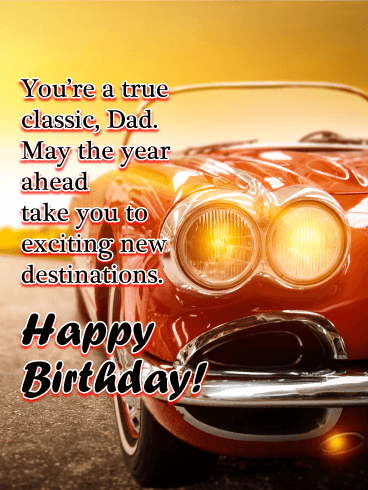 The classic car on this birthday card will help your dad celebrate in style! It's a chance to wish him all the best life has to offer while hoping the year ahead takes him to many exciting new destinations, which he'll always remember. It's the perfect greeting to choose if you want to put a big smile on his face and fill his day with joy. 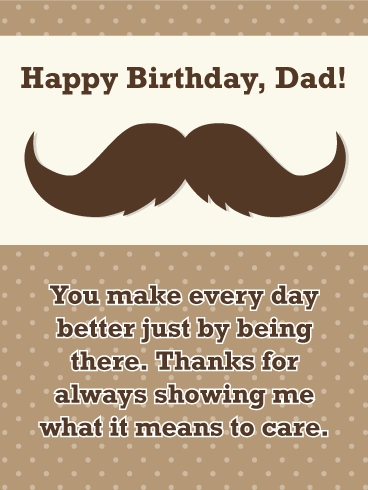 This mustache-themed card is the most fun and thoughtful way to say, "Happy birthday" to your amazing dad! The words are full of sentiment, letting him know he makes every day better just by being there. He is the person who has taught you so much and is always on your side, which is something you'll always treasure. What a great time to remind him of that while making him feel like #1. Blue skies. Shining sun. A sailboat cruising along the peaceful open sea. 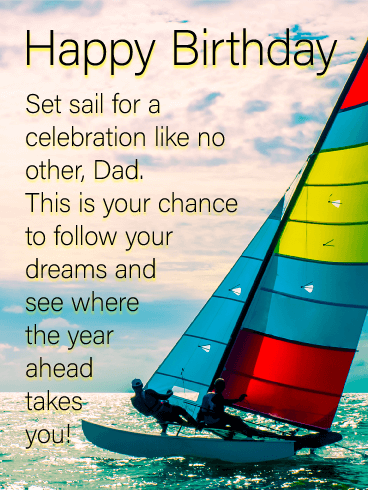 If this is your dad's idea of the perfect birthday celebration, he's sure to appreciate this cool, nautical-themed card as he sets sail on another year of adventure. Send him off with this thoughtful greeting and your best wishes for many more happy days ahead and the chance to follow his dreams wherever they may take him. You feel truly blessed to be able to call such a wonderful man, dad. Show how much you love the positive influence your amazing father has had in your life by sending him this gorgeous blue card filled with cheerful yellow flowers. Wish him a 'happy birthday' while also making him feel proud of the strong person he helped raise! He's more reliable than a locomotive. More powerful than any ouchie or boo-boo. He's a Super Dad! 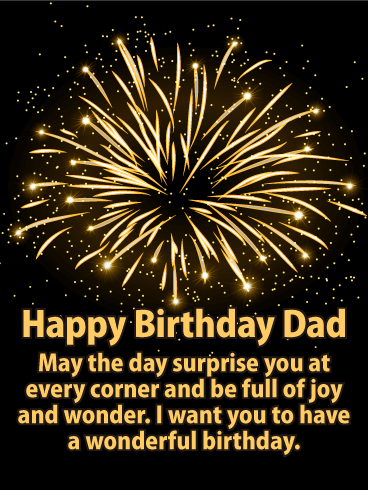 Make your father feel like the all time champion he is with this parade of shiny, golden balloons on a tastefully patterned brown background. 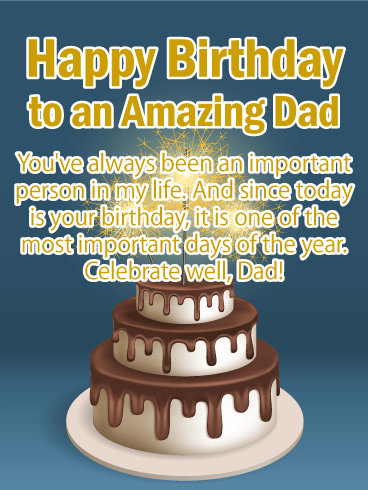 By choosing to send this happy birthday card to your Pop, you're proclaiming from the figurative rooftops: "My Dad is Number 1!" Ghandi said "Be the change you wish to see in the world". What could be a bigger change for the better but to raise ones children to bring forth love and light. 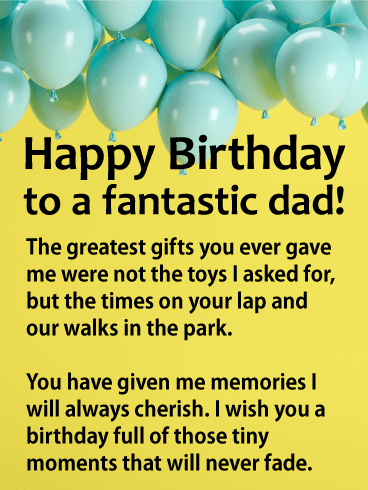 On his birthday, wish your father the day he deserves by sending him this balloon birthday card. Dad sows the seeds of love, so may his harvests be ever plentiful, and may his day be as good to him, as he is to the world! You were never one of those kids embarrassed of your old man while growing up, because your father is timeless. 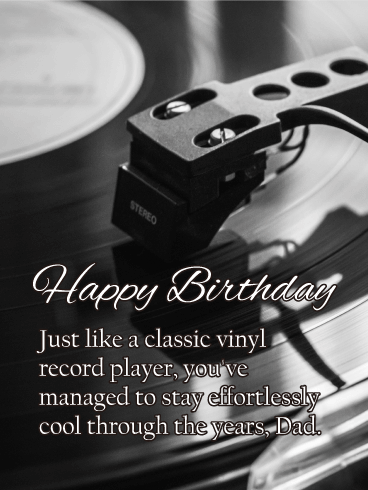 Assure dad of the fact that you still find him just as cool as ever with this vintage vinyl record player happy birthday card. Now put on some retro tunes and ask him to show you some classic dance moves! Your father works hard for his family and others every day of the year! 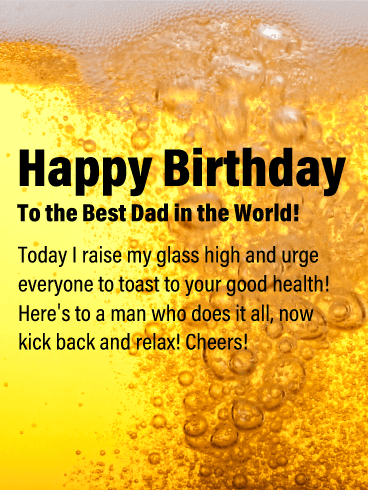 Now send him this foaming beer mug birthday card to let him know that while you appreciate all his hard work, it's okay for him to spend his special day relaxing and having a few beers! Dad is the best, raise up cheers to an awesome man! Does your father appreciate a good brew? 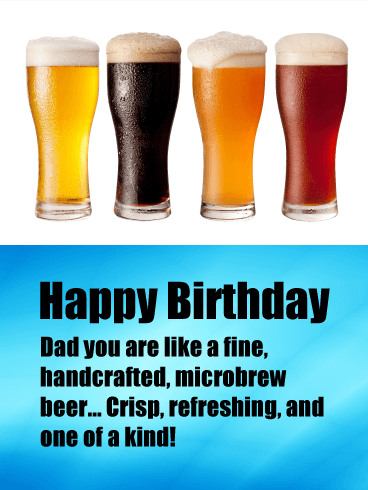 Send that classy gentleman this appealing birthday card featuring a flight of four foaming craft beers in tall, glistening mugs! Show him some love with its complimentary message likening him to one of those fancy IPAs or stouts he so enjoys! He's one of a kind and he deserves to hear about it on his special day! Dad is a true, bona fide grill master who has always kept the family well-fed with his fresh, barbecued treats! 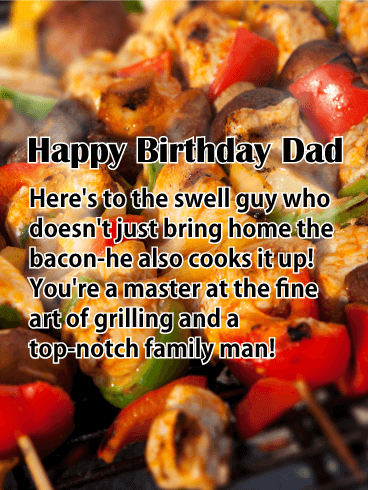 Maybe this birthday you give him the day off, fire up the bbq, hand him a beer, and throw some steaks on- or maybe not! Maybe your father enjoys grilling so much he takes the beer and promptly also takes over the grilling duties! Either way, start the day off right by sending him this mouthwatering birthday card! A father is often their child's first hero. Celebrate your first hero today by sending him this colorful firework display birthday card. 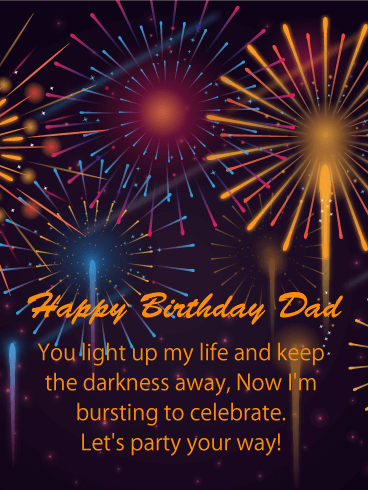 Including a sweet message letting him know he lights up your life, this happy birthday card won't fail to light up dad's face with a huge smile! It even says you want to party his way, guaranteeing he'll have the best day ever! Over the years, your dad has given into every pout you gave him. He catered to your every wish and whim, whether it was your birthday or not. Let him know how much you love him for that by turning the tables on him for his birthday. This year, let your dad know that anything he wants, he'll get! Within reason, of course. When you were five and asked to write about your hero, you, of course, chose your father. Your dad is incredible, no doubt about it. He's strong and a wonderful role-model. So much of what you have achieved is because of him. 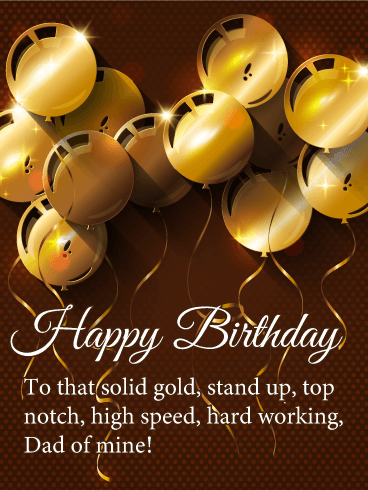 Celebrate his life by sending him this fantastic birthday card. Let him know that near or far, he's always close to your heart. Important people don't leave us alone. They stay in our thoughts, their lessons guide our actions, and we fondly recall the memories they feature prominently in. Your father is important, thus his birthday is an important day. Not just to him, but to you too because it's your chance to support him and let your dad know he's a pillar of your life. Make him realize how important he is, to you and to the world, on your father's birthday! Your humor is something you get from your dad. Or maybe your mom. They always blame the other person, but they can't deny that you fit right in. What else is family but people who deal with all your idiosyncrasies? Take today to celebrate your dad's habits. You're family, family sticks together, and together you always have a good time. 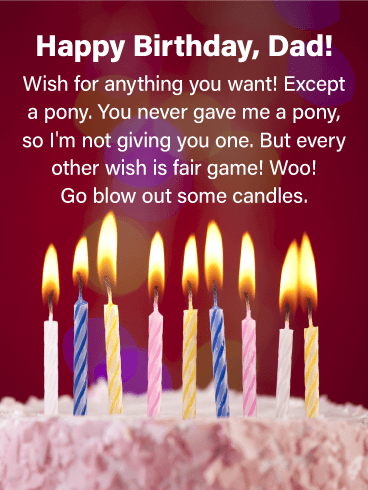 But make sure today, his birthday, is one of the best times of his life with this funny birthday card! Make your dad feel special on his birthday! This dog knows how to rock a top hat and bow tie because he's a master of style. And so is your dad! He's the king of class, the guru of glamour, the suave czar. But at his center, he's your dad and everything about him deserves to be called out and celebrated. 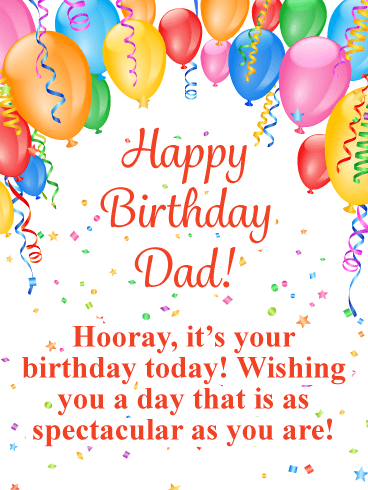 Wish your dad a fabulous birthday and help him do it with flair. They say absence makes the heart grow fonder, but sometimes it's time that helps us reevaluate relationships. As a child, your dad was part hero, part torturer, but as you grew up you realized he was more than your childhood extremes. He's a well-rounded man with incredible values, who is the glue that keeps your family together and happy. 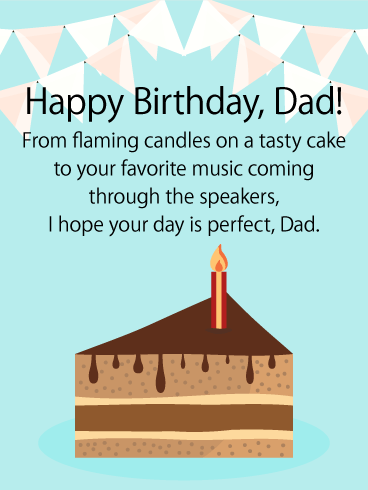 Let your dad know how much you admire him and wish him luck and success on his birthday. A little excitement keeps the mind alive and turns an ordinary action into a wondrous adventure. So turn the tables on another birthday for your dad by pumping it full of fireworks! Make sure that this day is nothing like the ones that came before it. 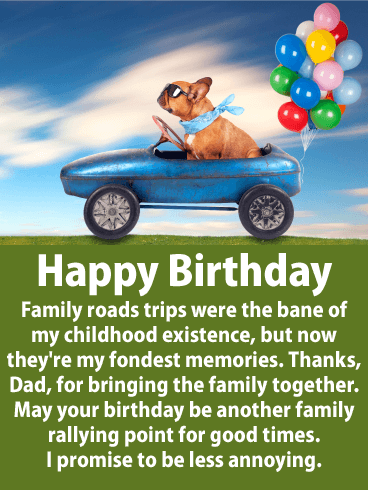 This year, wish your dad a lively birthday, full of a brand new sense of wonder and the magic feeling that anything can happen on your birthday. Protector. Comforter. Cook. Personal Assistant. Your dad has taken on a lot of roles to help you over the years. He’s an incredible man, to do so much for you. You have no doubt about how much he loves you. 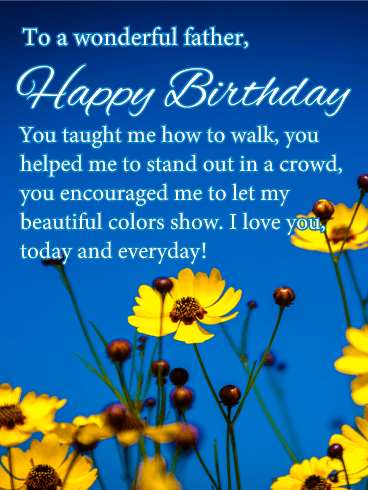 Let him know you love him too by sending this heartfelt birthday card. His love for you run deeps and you love him just as much. 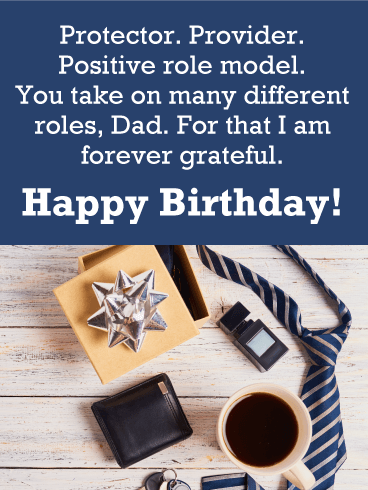 Fill your dad's birthday with the happiness and respect you feel for him. 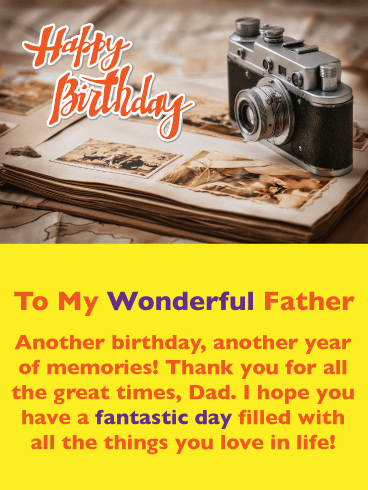 Most fathers use a camera to capture the wonderful memories of their special times with their children, so your father will be able to relate to this birthday card when he sees the vintage camera and photo album. It will surely put a smile on his face! Thank your father for all the great times and wish him a fantastic day, he will appreciate it, especially since it is from his child! Birthdays are a special occasion and a birthday card should certainly reflect that. That's why this extravagant greeting card would be perfect for your father's big day! It has celebration written all over it! 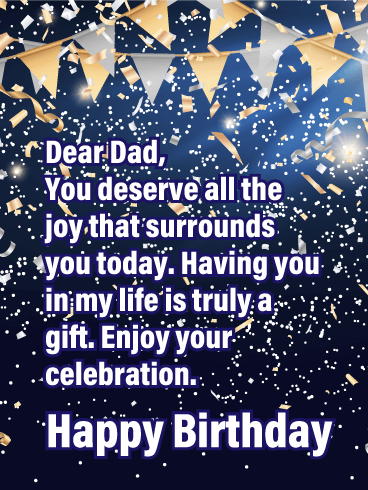 Colorful balloons, confetti, and fancy text all come together to form a wonderfully festive birthday card that your father would be happy to receive on his birthday. 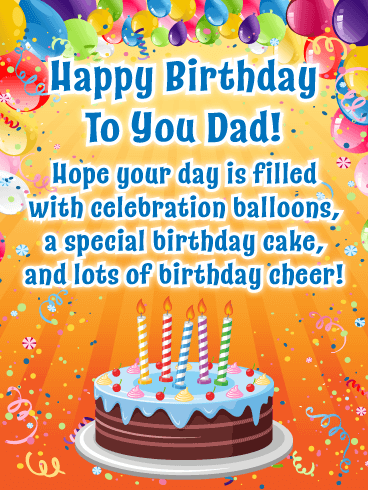 Say hooray and wish your father a happy day by sending this exciting birthday card out today! Another year has gone by and it's your father's birthday again! It's clearly time to send him a greeting card that reflects this grand occasion, and this birthday card will do just that! It showcases sensational blue frosted cupcakes, sparkling party lights, bright happy colors, and creative Happy Birthday lettering. This birthday card isn't missing a thing! 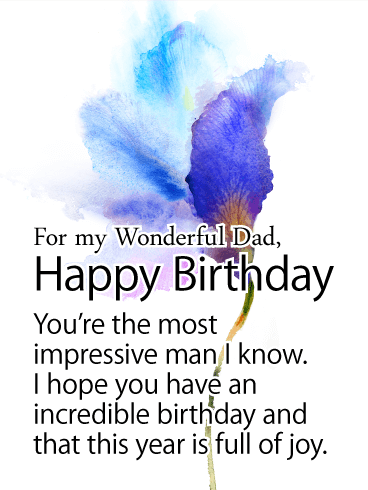 The most important element of this birthday card is that it lets your father know how much you love him. Fathers deserve to have an exciting celebration and this birthday card is just the start of it! When he receives this outstanding greeting card, he will be reminded of the excitement that awaits him! It features the best birthday cake ever, party balloons, celebration confetti, vibrant colors, and more! This birthday card will also remind him that today is his day to shine! This will certainly make your dad feel special on his birthday. 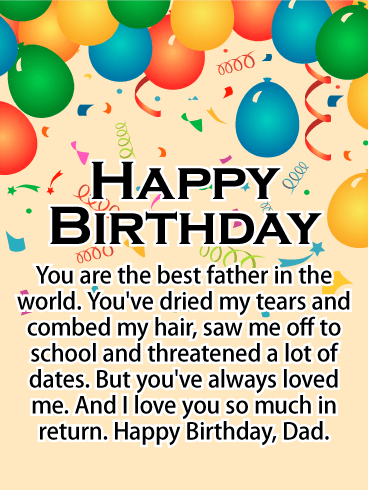 If you feel that your father deserves to receive the best birthday card, then you are in luck! This colorful birthday card features creative Happy Birthday lettering and decorative birthday balloons that will be sure to brighten his big day! 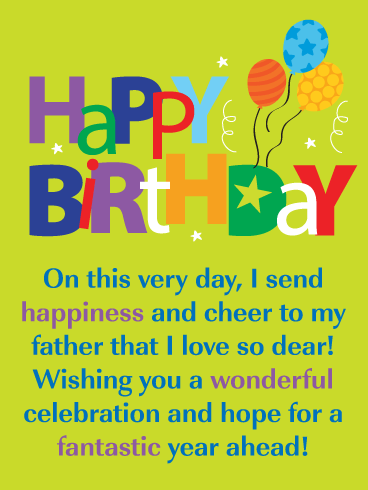 The message was written just for your father and lets him know you are sending happiness and cheer for his birthday! It also expresses how much you love him. So special! 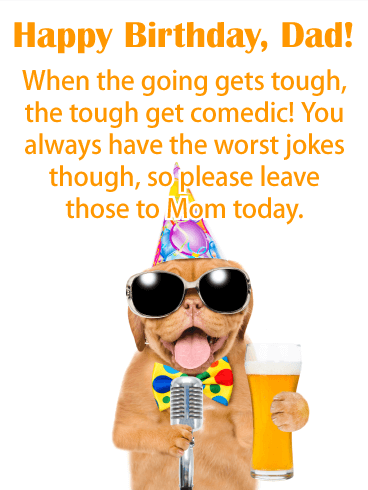 This birthday card has it all and your father is going to really like it!